The work of "achieving peace" between the Israelis and Palestinians peace needs "your continued, determined engagement," U.S. Jewish, Christian and Muslim leaders told Secretary of State John Kerry. "We believe the time for Israeli-Palestinian peace is now," they said in a May 20 letter to Kerry. "We continue to be committed to mobilizing public support of our members in synagogues, churches and mosques across the country for your efforts, and we look forward to meeting with you at an appropriate time to discuss ways we can help," they said. 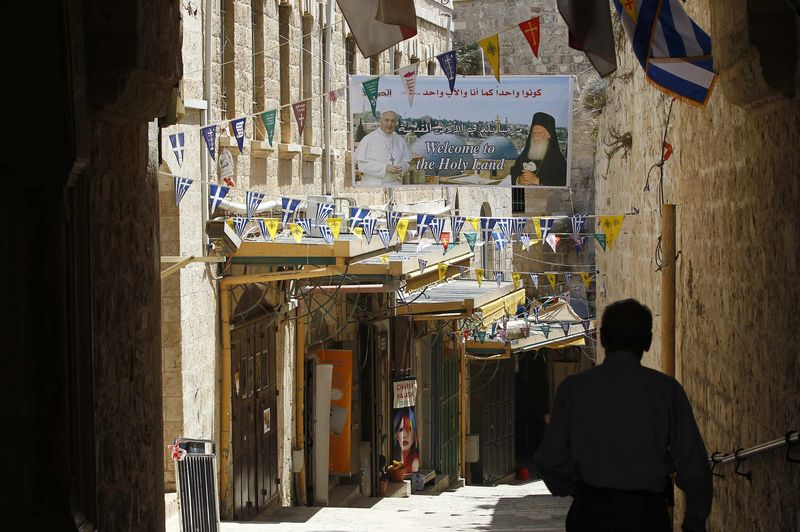 The letter, signed by 33 faith leaders and released May 21 by the U.S. Conference of Catholic Bishops, was sent in advance of Pope Francis' May 24-26 trip to the Holy Land. He said his visit to Jordan, Israel and the Palestinian territories would be "strictly religious." Catholic signers of the letter to Kerry included Bishop Richard E. Pates of Des Moines, Iowa, chairman of the U.S. bishop's Committee on International Justice and Peace of the U.S. Conference of Catholic Bishops, and Cardinal Theodore E. McCarrick, retired archbishop of Washington. Jewish signers included Rabbis Rick Jacobs, president of the Union of Reform Judaism, and Rick Block, president of the Central Conference of American Rabbis. The Muslim signatories included Imam Mohammed Magid and Sayyid Muhammad Syeed, president and national director, respectively, of the Islamic Society of North America. "A two-state agreement in which both peoples will live in peace, security, and mutual recognition represents the only realistic resolution of the conflict," the letter said. "Over time, developments on the ground and failures of leadership are making that goal more difficult to achieve." The signers noted their united support for Kerry's "commitment to achieve peace, drawing on benchmark principles and practical ideas from previous official and informal negotiations that offer possible compromises to resolve all issues in the conflict."